The Diamond Bar Stool Cream exudes minimalism with several unique details and features. Incorporating futuristic style with traditional elegance, the Diamond is a refreshing piece of furniture that will have a fashionable impact on your interior. 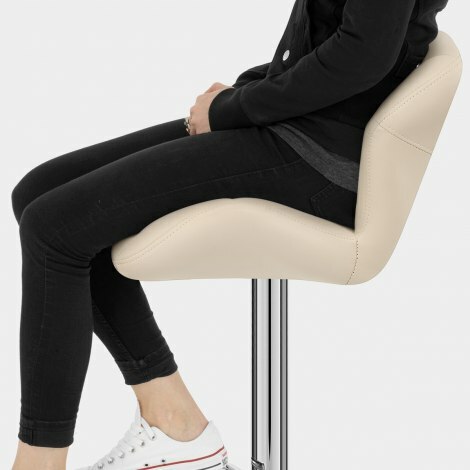 The seat is upholstered in cream faux leather and is vastly padded for ensured comfort. Featured on the seat and medium height backrest is a stitched detailing that creates distinguished diamond shapes. It also provides a characteristically angular look that continues to the edges of the seat and generates a striking silhouette. 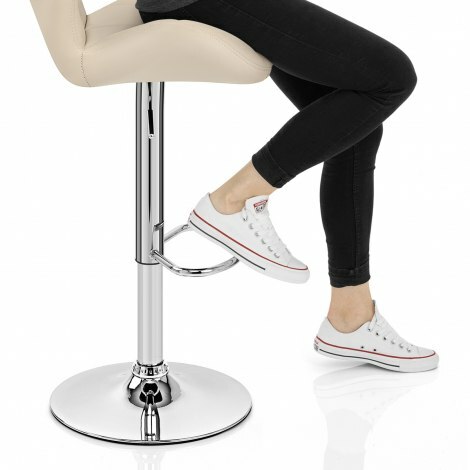 Meanwhile, a gas lift mechanism within the sleek mirrored chrome stem gives adjustable height and 360-degree spin, whilst a central footrest ensures stability. Finished with a protective base for your floors, the Diamond will not disappoint. Excellent service from ordering, delivery and refund for a stool with a slight defect. I would highly recommend Atlantic Shopping. Absolutlely fabulous comfy stylish and I put them up myself so easy no man required. The delivery driver was on time, couteous and polite. The chairs arrived when you said, they were easy to put together and the quality is outstanding, thanks! Great! Easy to assemble looks good and stylish.